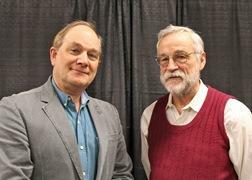 Mystic, CT – Dr. Roger James Kuhns and Dr. George H. Shaw recently published a book through Springer (2018) entitled "Navigating the Energy Maze: The Transition to a Sustainable Future". In this book, Kuhns and Shaw present a plan for the development of a comprehensive sustainable energy policy for the United States. They examine the diverse types of energy, their resources, and materials needed to develop and use them. They provide communities and cities with ways to better control their destinies by locally managing energy use and generation. "A must-read for anyone interested in solutions oriented methods to address climate change," says Citizens' Climate Lobby's Executive Director, Mark Reynolds. Pricing carbon is the bill that Kuhns and Shaw propose as a foundation along with seven other specific legislative initiatives necessary for a national comprehensive sustainable energy policy. They propose that these initiatives can both facilitate and drive the process of evolution from a carbon-energy economy to a sustainable renewable energy future. The book does not suggest the undoing of existing infrastructures and energy providers, but rather a cooperative transition from national-regional energy management to a more local-centered system. "Our society is at a critical juncture where we now have to make sustainable choices in our energy sources," says Roger Kuhns. "We are entering a transformation from a carbon economy to a renewable energy economy and sustainable society. How we do this depends on our policies, perceptions of urgency, and our understanding of the sciences. This book lays out the policies we need to get this transformation moving in a sustainable direction." The book is available for purchase at http://www.springer.com/gp/book/9783319227825. Roger James Kuhns hold a PhD in economic geology and has over 35 years of experience in mineral exploration and natural resources, water and energy resources, environmental remediation, renewable energy systems, and sustainability. He's been a guest lecturer on sustainability, science and energy issues at the University of Wisconsin, City College NYC, Rider University, Union College, and the University of Pennsylvania. He is the founder of SustainAudit, a sustainable practices company that advises companies on integrating renewable energy systems, materials, LEED, and food systems to ensure long-lasting resources and economic affordability. Dr. George H. Shaw has had a career as a professor of geosciences with an emphasis on geophysics, especially high-pressure measurements of elastic properties. He has taught at the University of Minnesota and Union College, and was awarded an NSF post-doctoral fellowship at Edinburgh, Scotland as well as an American Geophysical Union Congressional Science Fellowship. Dr. Shaw worked for Congressman Al Swift on energy and environmental issues, and particularly on the formulation and passage of the Nuclear Waste Policy Act of 1982.